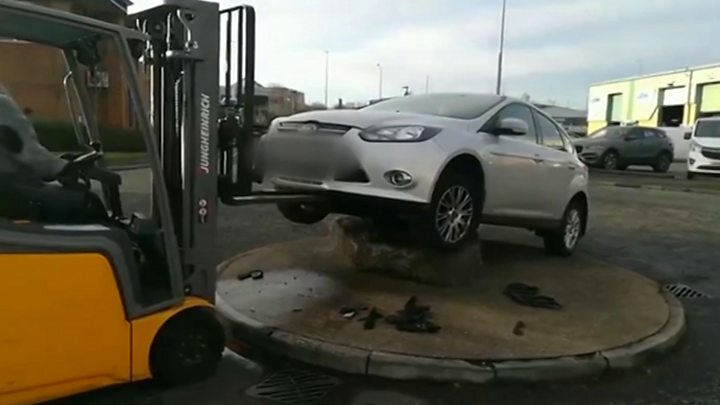 A car ended up "balancing precariously" on top of a mini-roundabout in Grimsby. 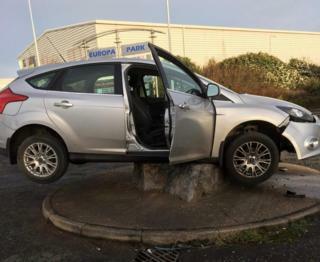 The silver Ford Focus was photographed on a rock above the roundabout linking Athena Drive to Victoria Way on the Europa Park industrial estate. Jeff Lewsam, who works nearby, said he was loading a van when he heard a "crunching" sound and saw the car perched on the roundabout. He said nobody was hurt in the incident, which happened on Tuesday morning. Mr Lewsam, an account manager at Ecotrol, said a colleague was looking towards the van and suddenly landed on top of the central island. "We don't know how they got it up on the roundabout and I don't reckon the person driving it did either," he said. "That's what you get for being nosey and not paying attention." Mr Lewsam said he and his colleagues managed to remove the vehicle from the mini-roundabout before it was taken away by a recovery vehicle.